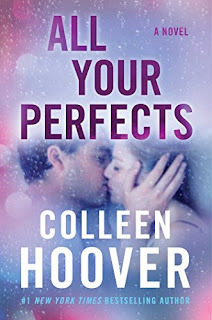 The Romance Cover: Review ~ All Your Perfects by Colleen Hoover ~ added to my ALL TIME favourites shelf too!! 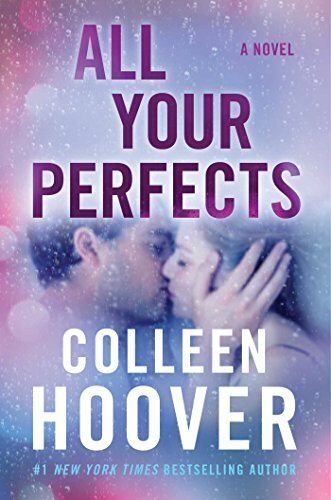 Review ~ All Your Perfects by Colleen Hoover ~ added to my ALL TIME favourites shelf too!! This is a review that I needed to write as soon as I finished the book. Normally I like to sleep on it, let my thoughts and opinions roll around my head to come up with something interesting and relevant to say. However, no matter how much thinking I do, nothing, and I mean nothing, will ever come close to representing what I just read. Nothing I could say could do this book justice, it was just one of those books that touched me on such a deep, emotional level, that I cried and I mean I CRIED. I have not cried this much over a book EVER and that is saying something. But this book, THIS BOOK, just drained me of EVERY. SINGLE. EMOTION. The message was something I could relate to, but my ending was magical, and while this couple had their own different magical ending, the road to get there just grabbed at my heart and soul and never let go, it still hasn’t. Colleen hoover delivers an unforgettable read and I mean UNFORGETTABLE. This will be one of those rare books that I put on my ALL-TIME list, a book that I will re-read time and time again. From the minute I picked it up, I couldn’t put it down, captivating, hypnotic, poignant, intense, brutally honest, raw, emotional, heart wrenching and yet one of the most beautiful books I’ve ever read. Beautiful, how so? Because this book is about true love. A love so intense, so finite and that soul mate connection we all want to find. A love that can stand the test of a category 6 and while their belief may get muddied, may be stretched to breaking point, maybe to the point of no return, that intrinsic love for one and other is what ultimately reigns supreme. A love so deeply embedded for one and other that no matter the crisis, no matter the crappy hand that you’ve been dealt, that LOVE is a permanent foundation, no wrecking ball has the power to destroy it and while it gives a good attempt at it, it doesn’t succeed. Graham and Quinn’s beginning is unconventional and yet while when they first meet may not have been their day, when their paths do cross again fate has definitely worked its magic. I adored Graham in this book, his personality shone through the pages, like this bright beacon of happy, hope and everything good in the world. His love for Quinn was ever present, he loves fiercely, he wore his heart on his sleeve and it just radiated off every single page, and yet the more the story progressed the more that light dimmed, but most importantly, it never went out. Graham wasn’t perfect, maybe for ninety-nine percent of the time he was, but when you are losing the one thing you love the most, desperate times call for desperate measures. He got a ten for the thought behind it, but a zero in execution. Quinn was in self-destruct mode in this book and it is one place that I could totally relate to. But this is where Colleen Hoover excelled, her portrayal of a woman in this position was honest, it was gritty, it was raw, it was warts and all. The gradual breakdown of Quinn and Graham’s marriage was a reaction to circumstance. A couple whose relationship was built on honesty and talking to one and other to one where they never talked at all. Those bottling up of emotions, thoughts and feelings that just multiply and multiply in your mind, until something relatively little, becomes a huge, huge problem. Where a couple that know what the other is thinking on a normal day, lose that ability and jump to all the wrong conclusions, they read the signs all wrong and the more they think, the more the problems manifest, the more they grow until the love is slowly pushed to the bottom and the problems just cascade over the top. Colleen Hoover is one master story-teller, the myriad of emotions she effortlessly puts you through while capturing a test in life that many couples face was nothing short of amazing. A test that many couples battle and one you will never truly understand until you find yourself in the same situation. But Colleen Hoover goes out of her way to make you live it and she certainly succeeds. For a marriage to survive it is true what this author says, “if you only shine light on your flaws, all your perfects will dim,” and it is those perfects that you need to concentrate on. Remember the best times, the hard times are there to test us, speed bumps on the road trip of your life, but where you end up is the most important, don’t let those speed bumps derail you. Be happy, everyone deserves to be happy, and while sometimes you have to change your perception of happy, make a new one. Life is what you make it. Focus on all your perfects. What an unforgettable book!